It's Saturday, the line-up is packed out and Long Beach is reeling left handers. You jump into your suit and paddle out to the pack. You look over you shoulder and see a wave heading towards you… you start to paddle and as you paddle you look right and see the wave has jacked up and started to break. As the wave breaks, you see another surfer dropping into it (remember, you're looking right) - you can't believe it! With a hint of anger, you stop paddling and back off the wave. What you did was the right thing. As a wave breaks, you have the peak of the wave (where the wave folds over) and next to it you have the wall of the wave that you ride. Where these two parts meet is what we call the shoulder; this is the take-off spot!! The surfer closest to the shoulder has the right of way for each wave—there are no exceptions!! So the next time you're out for a session, push yourself closer to the peak—it's a little harder and a little heavier, but you'll find yourself getting longer faster waves, with no one yelling at you! I know each one of us in the water does not want to be known as the 'guy who drops in on everyone'. The line up is where we wait to catch waves, just a little out side of where they break. Most of us sit on our boards and face off shore to watch for incoming waves because different size waves will break closer to shore and further out. So our point of take off will vary on any given wave. When a set comes in, your position in the line up will dictate whether you can paddle for the wave or not. If the surfer closest to you is closer to the shoulder or peak and he or she has been waiting longer than you in the line up he or she is most definitely in turn for that wave! You should be looking at the next wave coming through the line up to determine if you are in position or not. We all have to share the water, so the safer we surf and the more we learn, the better our sessions will be. Kayakers: that goes for you as well! Do not paddle out to a break that is beyond your ability. (Learning to surf at Jordan River in the winter is a bad idea). When paddling out and confronted with a wave hovering overhead don't ditch your board! Hold onto it and learn how to duck dive. When you have paddled out and made it to the line up, taking the 1st wave you see is poor etiquette. Remember there is a line up of sorts. Smile, ask questions, take some time to look around and see where the take off spots are and where the best places to paddle are at. Respect the locals: they have a lot of knowledge of the waves and the beaches in that particular area. If you paddle out with an attitude that is what you will get back. Don't paddle around someone who is in position to catch a wave by paddling further out or further inside. They are in position set up for the next wave. The most important thing that we can all bring with us to a surf session is our common sense. Without the understanding of some simple guidelines it will only be a matter of time before someone in your surf session gets seriously hurt! Jay Bowers has been living in Tofino since the early '90s. 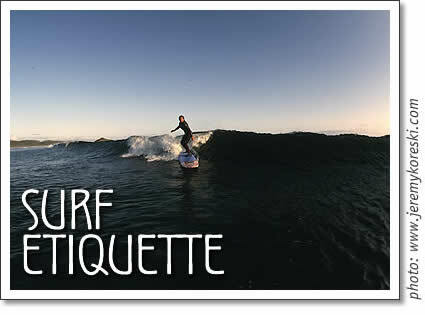 Tofino surfing: An introductiion to surf etiquette for surfing in Tofino by surf instructor Jay Bowers of Pacific Surf School.